STOCKTON, CALIFORNIA (September 2, 2017) – 2016 Pacific Challenge Series Rookie of the Year Matt Wendt became the eighth different winner in eight races this year as claimed the victory on Saturday night at Stockton 99 Speedway. Wendt motored past Mike Beeler with three laps to go to become the sixth “first-time” PCS winner of the season as well. The PenneyLawyers.com sponsored action for the 100 lap Tri-Holiday #3 had all the twists and turns deserving of the red hot evening, where temperatures soared near 110 degrees during practice and qualifying. Temperatures were not much lower at race time either on the historic quarter-mile paved oval. 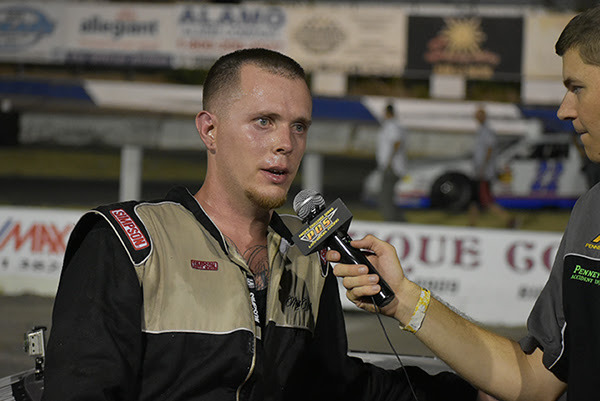 Granite Bay’s Cole Moore won the Sunoco Fuels fast-time for the fourth time in the last five races, but started eighth in the American Racer Tire Dash after a full invert. Front row starters Travis Milburn and Greg Potts finished 1-2 in the dash with Milburn earning $500 cash and the pole for the main event. Milburn jumped out ahead of Potts at the initial start of the main event and led the opening lap. The caution flew going into turn one when former Stockton track champion Matt Scott spun with contact from Tracy Bolin. Tim Sprugeon’s 2017 PCS debut went up in smoke as he left oil around the track after suffering damage in the melee. A 20 minute red flag challenged both drivers and their cars, but Milburn managed to maintain the lead on the next restart. Third-generation Stockton driver Ross Strmiska stopped in turn four with a flat tire for the next yellow on lap seven. 2014 PCS champion Mike Beeler seized the opportunity to race side-by-side with Milburn and take the lead on lap nine. Cole Moore followed suit as he shot from fourth to second on the outside on lap 11. The leaders encountered lapped traffic by lap 23 while behind them, Strmiska was tearing through the pack. He made his way near the front of the second pack behind the top four leaders. Greg Potts fell backwards until he retired to the pits with brake issues. The next caution did not fall until lap 43 when his son Colby Potts had a tire go down. Fourth running Wendt used the restart to get around Milburn for third. The lead trio of Beeler, Moore, and Wendt would anchor the field the rest of the way while Strmiska found himself up to fourth. Matt Scott continued to comeback from the lap one spin, using nice inside passes to overhaul John Moore for fifth on lap 62 and then work on Strmiska on lap 68. Meanwhile, Wendt began to show his nose to Cole Moore for second. Strmiska’s night began to go the other direction as he fell back to the eighth spot by lap 81. The lead trio remained nose to tail the entire second half of the event. Wendt managed to clear Cole Moore for second finally on lap 84 and he immediately challenged Beeler. Wendt had a strong run up the inside in turn four on lap 89, but he went sideways which allowed Moore to roar past him on the outside for second. Wendt dove inside Moore several times and cleared him on lap 97 then jumped inside Beeler the following lap and leapt past him for the lead as the field completed lap 98. The remarkable pass gave him the momentum to pull away to a thrilling .905 second victory at his home race track. Beeler was forced to settle for second after leading 90 laps with Cole Moore third ahead of Scott and Milburn. Beeler’s second place finish scored him a ten point gain on John Moore who finished seventh. That brings the difference to just two points with two races remaining in the series. The Pacific Challenge Series presented by PenneyLawyers.com continues September 16th at All American Speedway in Roseville, CA for the ninth round of the 10 race Super Late Model series. 12 22 Greg Kamper Ripon, CA Kamper Fabrication, Inc.